Králův Dvůr (pronounced [ˈkraːluːf dvuːr], German: Königshof) is a town in the Central Bohemian Region of the Czech Republic. It is located very close to Beroun. It has a population of 6,201 (2006). The first mention of this town was written in 1394. In the first half of the 13th century, Wenceslaus I probably built a medieval yard in this town. In 1930, Králův Dvůr attained the status of městys. It was upgraded to town on 5 October 2004. Since 1988, a D5 motorway has led through the town, which caused the town to not have a natural town centre. 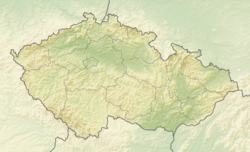 This Beroun District location article is a stub. You can help Wikipedia by expanding it. This page was last edited on 2 November 2018, at 00:21 (UTC).